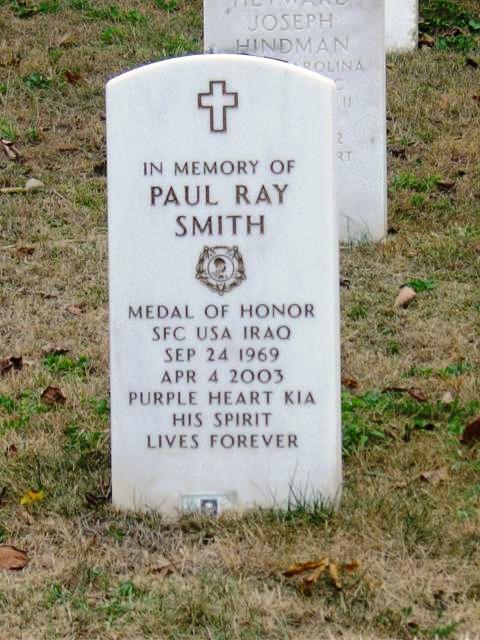 Sergeant First Class Paul R. Smith distinguished himself by acts of gallantry and intrepidity above and beyond the call of duty in action with an armed enemy near Baghdad International Airport, Baghdad, Iraq on 4 April 2003. On that day, Sergeant First Class Smith was engaged in the construction of a prisoner of war holding area when his Task Force was violently attacked by a company-sized enemy force. Realizing the vulnerability of over 100 fellow soldiers, Sergeant First Class Smith quickly organized a hasty defense consisting of two platoons of soldiers, one Bradley Fighting Vehicle and three armored personnel carriers. As the fight developed, Sergeant First Class Smith braved hostile enemy fire to personally engage the enemy with hand grenades and anti-tank weapons, and organized the evacuation of three wounded soldiers from an armored personnel carrier struck by a rocket propelled grenade and a 60mm mortar round. Fearing the enemy would overrun their defenses, Sergeant First Class Smith moved under withering enemy fire to man a .50 caliber machine gun mounted on a damaged armored personnel carrier. 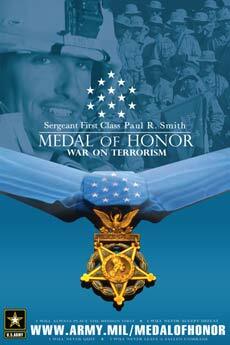 In total disregard for his own life, he maintained his exposed position in order to engage the attacking enemy force. During this action, he was mortally wounded. His courageous actions helped defeat the enemy attack, and resulted in as many as 50 enemy soldiers killed, while allowing the safe withdrawal of numerous wounded soldiers. 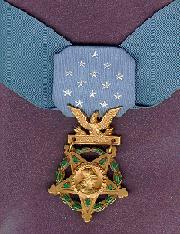 Sergeant First Class Smith’s extraordinary heroism and uncommon valor are in keeping with the highest traditions of the military service and reflect great credit upon himself, the Third Infantry Division “Rock of the Marne,” and the United States Army. 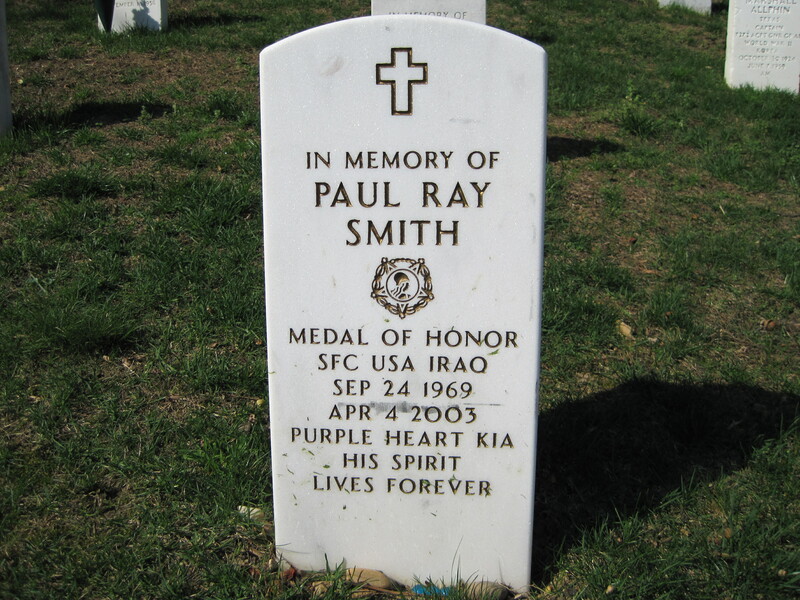 Sergeant First Class Paul Ray Smith will receive the Medal of Honor posthumously during a White House ceremony April 4, 2005. The official citation will be made available after the White House Presentation. Baghdad Airport, April 4, 2003. Bravo Company's view of Highway 8 leading East into Baghdad. The berms were created by combat engineers to impede an enemy attack. On April 4, 2003, the 1st Brigade Combat Team, 3rd Infantry Division, attacked to seize Objective Lions, the Baghdad International Airport. As part of the Brigade scheme of maneuver, Task Force 2-7 Infantry was tasked to establish a blocking position against a brigade-sized counterattack on the main entrance to the airfield. Task Force 2-7 had been fighting for three consecutive days and had moved through the night before reaching the blocking position. Morale was high, but Soldiers were experiencing fatigue. B Company, 3rd Battalion, 69th Armored Regiment (Knight) was in the east-most position oriented along the main avenue of approach ready for the main enemy counterattack. A Company, 2nd Battalion, 7th Infantry Regiment (Rage) was attacking to the southeast of the Highway. The main entrance to the airfield was a four-lane highway with a median to separate incoming and outgoing traffic. Large masonry walls with towers approximately 100 meters apart bound the highway. On the morning of April 4, 2003, more than 100 soldiers from the Task Force 2-7 Forward Aid Station, mortars, scouts and portions of B Company, 11th Engineer Battalion were in the median behind the forward most blocking positions. The B Company, 11th Engineer Battalion 2nd Platoon Leader was on a reconnaissance mission with the B Company, Task Force 2-7 Infantry Commander. During his absence, 2nd Platoon received the mission to construct an Enemy Prisoner of War holding area. Sergeant First Class Smith was in charge of 2nd Platoon. Sergeant First Class Smith assessed the best location to be behind the masonry wall bounding the highway. Two guard towers along the wall were ideally situated to provide overwatch to the holding area. An M9 armored combat earthmover (ACE) knocked a hole in the wall to create an opening to a large courtyard with a louvered metal gate on the north side. With the help of a squad leader and team leader, Sergeant First Class Smith checked the far side of the courtyard for enemy, found none, and posted two guards. From the guard post at the gate small groupings of buildings were 100-200 meters to the northeast. To the northwest, a large white building with a white dome was visible. The location seemed perfect as the courtyard was along the northern flank of the blocking position and enemy actions to this point were mostly from the east. Sergeant First Class Smith's view from his position in the courtyard. Iraqi troops were firing from the tower on the left, and climbing over the wall in front. While an engineer squad began to clear debris in the courtyard, one of the guards saw 10-15 enemy soldiers with small arms, 60mm mortars, and rocket-propelled grenades (RPG). These were the lead elements of an organized company-sized force making a deliberate attack on the flank of Task Force 2-7. Sergeant First Class Smith came to the position and identified 25-50 more soldiers moving into prepared fighting positions. Sgt. 1st Class Smith instructed a squad leader to get a nearby Bradley Fighting Vehicle for support. While waiting for the Bradley, Sergeant First Class Smith had members of 2nd platoon retrieve AT-4 weapons and form a skirmish line outside the gate. By this time, the number of enemy identified rose to 100 soldiers, now a confirmed company-sized attack. Three of B Company’s M113A3 armored personnel carriers (APC) oriented .50-cal. machineguns toward the opening in the wall and the surrounding guard towers, now occupied by enemy soldiers. Sergeant First Class Smith’s actions to organize a defense against the deliberate attack were not only effective, but inspired the B Company, 11th Engineer Battalion Soldiers. He then began to lead by example. As the Bradley arrived on site and moved through the hole in the wall toward the gate, Sergeant First Class Smith ran to the gate wall and threw a fragmentation grenade at the enemy. He then took two Soldiers forward to join the guards and directed their engagement of the enemy with small arms. The enemy continued to fire rifles, RPGs, and 60mm mortars at the Soldiers on the street and within the courtyard. Enemy soldiers began moving along the buildings on the north side of the clearing to get into position to climb into the towers. Sergeant First Class Smith called for an APC to move forward to provide additional fire support. Sergeant First Class Smith then fired an AT-4 at the enemy while directing his fire team assembled near the front line of the engagement area. Running low on ammunition and having taken RPG hits, the Bradley withdrew to reload. The lead APC in the area received a direct hit from a mortar, wounding the three occupants. The enemy attack was at its strongest point and every action counted. Not only were the wounded Soldiers threatened but also more than 100 Soldiers from B Company, the Task Force Aid Station, and the Mortar Platoon were at risk. Sergeant Firstt Class Smith ordered one of his Soldiers to back the damaged APC back into the courtyard after the wounded men had been evacuated. Knowing the APC ’s .50-Cal. machinegun was the largest weapon between the enemy and the friendly position, Sergeant First Class Smith immediately assumed the track commander’s position behind the weapon, and told a soldier who accompanied him to “feed me ammunition whenever you hear the gun get quiet.” Sergeant First Class Smith fired on the advancing enemy from the unprotected position atop the APC and expended at least three boxes of ammunition before being mortally wounded by enemy fire. The enemy attack was defeated. Sergeant First Class Smith’s actions saved the lives of at least 100 Soldiers, caused the failure of a deliberate enemy attack hours after 1st Brigade seized the Baghdad Airport, and resulted in an estimated 20-50 enemy soldiers killed. His actions inspired his platoon, his Company, the 11th Engineer Battalion and Task Force 2-7 Infantry. Sergeant First Class Smith’s actions to lead Soldiers in direct contact with a numerically superior enemy--to personally engage the enemy with a fragmentation grenade, AT-4, and individual weapon, to ultimately assume the track commander’s position to fire the .50-Cal. machinegun through at least three boxes of ammunition before being mortally wounded--demonstrates conspicuous gallantry above and beyond the call of duty. His actions prevented a penetration in the Task Force 2-7 sector, defended the aid station, mortars, and scouts, and allowed the evacuation of Soldiers wounded by indirect enemy fire.